Summary: Why do we call this yummy, gluten free, dairy free, vegan macaroni and cheese "Vegan Macaroni and Cheese #3"? Because it is the third gluten-free mac and cheese that we have featured on The Happy Gluten Free Vegan. This vegan mac and cheese is our very own recipe, and we're really proud of it. This mac and cheese does not use any commercial cheese substitute, and so is perfect for people who want to keep it simple, or who get upset tummies from some of the vegan cheese substitutes. It uses a 'cheese' sauce made of cashews, nutritional yeast, and ingredients you are likely to already have in the house. Place cashews in a bowl and cover with filtered water. Let stand at room temperature for 3 to 8 hours. Cook the macaroni according to directions. While the macaroni is cooking, drain cashews and place in food processor with ‘S’ blade, or in heavy duty blender such as a Vitamix. Process cashews until finely ground, and then slowly drizzle in some filtered water until the mixture takes on the consistency of thick cheese sauce. Add mustard, lemon juice, salt, and nutritional yeast, and process until well-blended. 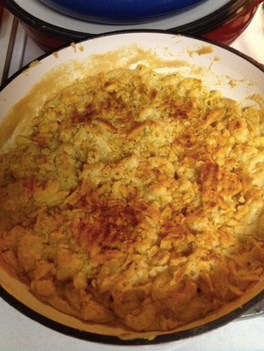 Drain cooked macaroni and place in greased (or oiled) oven-proof casserole dish. Mix the cheese sauce into the macaroni until well-mixed. If you choose to top the macaroni and cheese with crushed up potato chips, this is the time to do it. Place macaroni and cheese in oven. Bake for 1/2 hour and then, if desired, switch the oven to ‘broil’ and broil until top browns. This mac and cheese does not use any commercial cheese substitute, and so is perfect for people who want to keep it simple, or who get upset tummies from some of the vegan cheese substitutes.